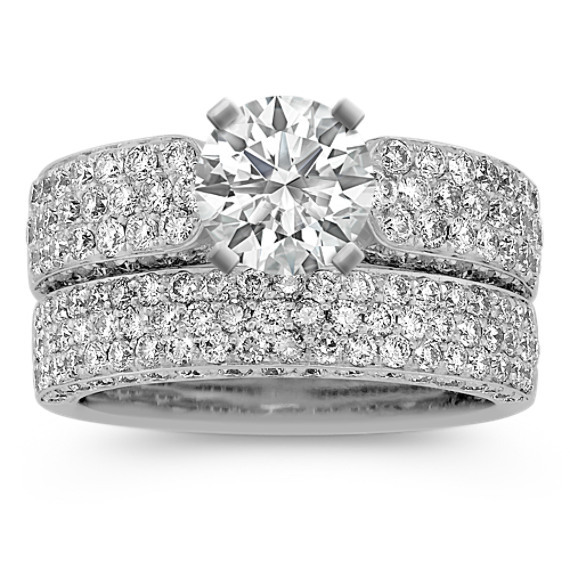 Pave-Set Round Diamond Wedding Set | Shane Co. This exquisite design features 171 round diamonds at approximately 2.28 carats total weight. Each lovely, hand-matched gem is pavé-set in superior quality 14 karat white gold. Six rows of diamonds as well as four rows of side diamonds serve as the perfect backdrop to the center diamond of your choice. Gemstone Carat Weight :2 1/4 ct. t.w.